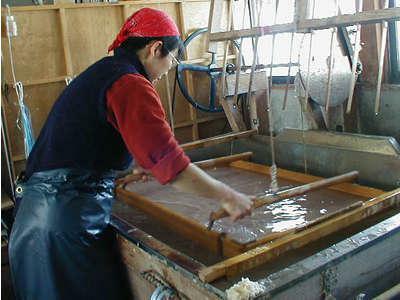 Kijimadaira’s Version of Snow-Country Uchiyama Paper Making. Learn the craft of making "Washi" -- traditional Japanese paper -- at Kamisukiya in picturesque Kijimadaira Village. Make a postcard using traditional papermaking techniques to take home as a souvenir. Other objects that can be made are business cards, paper fans, even paper lamps. "Art Lamp" lessons also available. With minimum 2 week advance notice, full 2-1/2 hour courses including preparing the pulp are offered. The northern Nagano 'washi' tradition called "Uchiyama" is renowned for the strength of the paper. Due to its strength it is commonly used as the paper in shoji screen room dividers. For over three and a half centuries, craftsmen have been taking advantage of Iiyama’s cold winters, heavy snow fall, and clear running water to make Uchiyama-style ‘washi’. 9:00-17:00 (10:00-16:00 Dec.-Mar.) Activities offered 9:00-11:00 and 13:00-16:00. Crafts made from Uchiyama 'washi' available for purchase. From Iiyama Station(JR Iiyama Line), 15 min. by taxi. From Toyota-Iiyama IC, Take Route 117 northeast 6.4km. At the Shinmachi signal turn right on to Route 38, cross the bridge and turn left staying on Route 38. In 4.8km, bear right at the "Y" on to Route 354 and proceed 250m to the Town Hall. Turn left following signs to Maguse Onsen and continue 1.5km and turn left. Kamisukiya will be in 300m.